Beth Dooley: In a Pickle! There must be some latent pickling gene I inherited from my grandmother. As a child, I followed her to various farm stands as we rumbled down old Highway 35 on our way to the Jersey shore. So, now that I'm near her age, I grow giddy as I race to the farmers markets, dashing from one stand to the next. It's summer! A time of smells and tastes and I want to capture it all. The boys are back home, screen door banging as they race in and out, off to work, to the lake, always with friends and ever hungry. We eat late, finishing yard work, lingering over drinks, the wisps of dusk fading in the cooling night. There is no real reason to "pickle and put things up" any more. Unlike my grandmother, I am not haunted by memories of the Depression, yet I share her sense of this seasonal rite. Perhaps she approached the task with a sense of drudgery, facing baskets of cucumbers, bushels of Jersey peaches, and those juice-splitting tomatoes, all aching for attention. It was her work, her pride. My efforts are slap dash and fun-filled. This last week, several high school girls came over to pickle beans. We changed the recipe, switching out the mustard seed for cumin, adding cloves and cinnamon sticks to the jars. We cranked up Fiona Apple, trimming beans and peeling garlic, working in sync. "Canning shaped my mother's life in ways that the young women who think of it as a craft will never know. And my mother shaped the culture of our family by canning, took the way we made our living and gave it variety, texture, consistency, taste. She reproduced and commented on all sides of life -- the mellowness of peaches in syrup, the tang of apricots, the sweetness of pears, the strong bite of tomatoes, the earthiness of peas and beans, the almost sexual mustiness of corn, the ethereal aroma of strawberry preserves, and the ocean brininess of sauerkraut." Pickling is a small link to a sunny childhood and the golden days I enjoy now, to these young friends as well as the women who came before us. Each batch holds the flavor and texture of a summer, each a surprise. 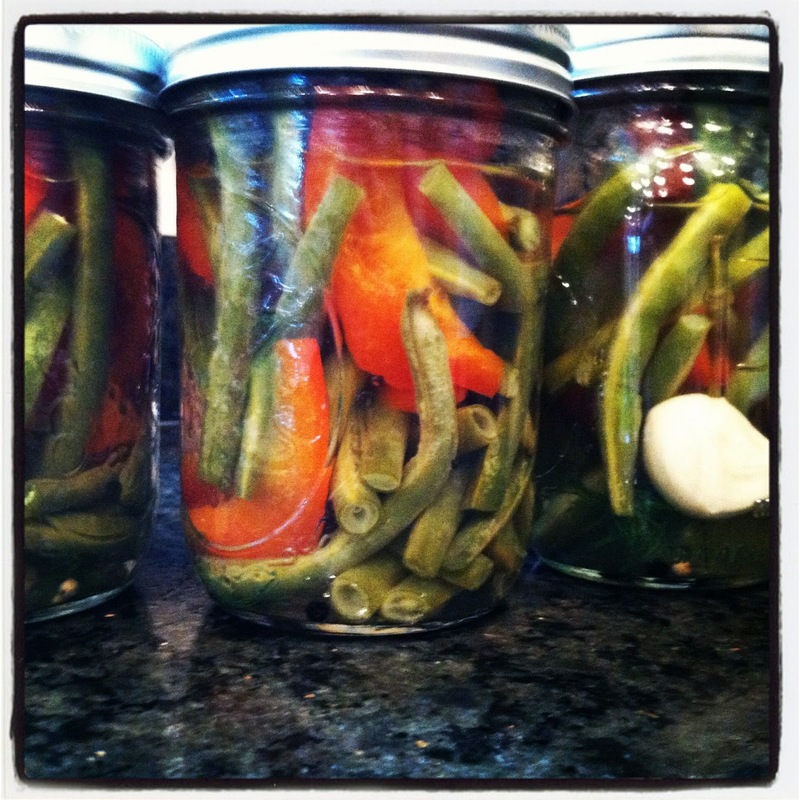 Wash and boil the pickling jars and lids according to manufacturer's directions. In a large stainless steel saucepan, combine the salt, vinegar and water. Bring to a boil over medium-high heat, stirring to dissolve the salt. Add the beans and peppers, return to a boil. Remove from the heat. Place a clove of garlic, 1 teaspoon cumin, and 3 peppercorns into each jar. Pack the beans and pepper strips into the hot jars to within a generous 1/2-inch of the top of the jar. Ladle the hot pickling liquid into the jar to cover the beans and peppers, leaving 1/2-inch of headspace. Wipe the rim; center the lid on the jar. Screw the band down until resistance is met, but do not screw the jar too tight. If processing, place the jars in the canner, ensuring they are completely covered with water. Bring to a boil and process for 10 minutes. Remove the canner lid and wait 5 minutes before removing the jars to cool. Store in a cool dry place. If NOT processing, allow the jars to cool then store in the refrigerator for up to 2 months.